In this lesson, we will learn how to solve problems on simple interest. Farida invests into an Individual Savings Account at the beginning of the year. An interest rate of is paid monthly on the balance in the account. How much money does Farida have in her Individual Savings Account at the end of the year if no other deposits or withdrawals are made and the interest rate stays constant? Fares and Sherif work at two different companies. Fares is paid £ 2 8 0 0 0 in the first year and gets a 3 % pay increase each year. Sherif is paid £ 3 0 0 0 0 in the first year and gets an increase of £ 1 2 5 0 every two years. Who is paid the most in the tenth year? Maged deposited $2 420 in a savings account, and it earned $363.00 in simple interest after five years. 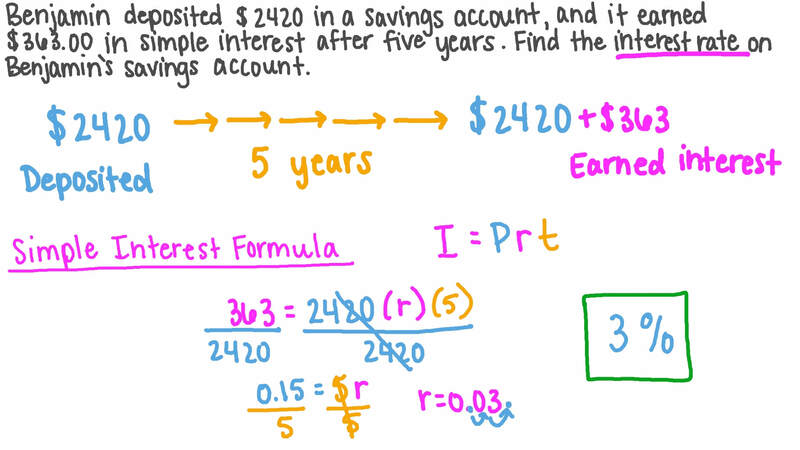 Find the interest rate on Maged’s savings account. A woman opened a bank account that offered 2 0 . 7 % interest per year. Given that she kept 6,000 LE in the account for a year, find the total amount she has after the interest is added. The formula 𝐼 = 𝑝 𝑟 𝑡 represents the simple interest 𝐼 earned on an account, where an amount 𝑝 is deposited at an interest rate 𝑟 for a certain number of years 𝑡 . Use the table to order the accounts from least to greatest in terms of the interest earned after 2 years.